The OpenNebula Team is proud to announce a release candidate for the first stable release of vOneCloud 1.0, a CentOS Linux virtual appliance for vSphere that contains all required OpenNebula services optimized to work on existing VMware vCenter deployments. vOneCloud deploys an enterprise-ready OpenNebula cloud in just a few minutes. vOneCloud extends vCenter with cloud features such as provisioning, elasticity and multi-tenancy; designed for companies that want to create a self-service cloud environment on top of their VMware infrastructure without having to abandon their investment in VMware and retool the entire stack. vOneCloud leverages advanced features such as vMotion, HA or DRS scheduling provided by the VMware vSphere product family. Ability to search for VM templates recursively. Do not miss a VM Template! VCenter password encrypted in vOneCloud host templates. Protect your infrastructure. Contextualization for vCenter VMs. Pass information (licenses, ssh keys, networking information) onto your vCenter VMs through vOneCloud. The OpenNebula team is proud to announce a new maintenance release of OpenNebula 4.10 Fox Fur. This release (4.10.1) comes with several bug fixes found after the 4.10 release. These bug fixes covers different OpenNebula components, like for instance the command line interface, the Cloud View self service portal, OpenNebula Core and several drivers (Auth, Storage), OneFlow and more. Check the full list of bug fixes in the development portal. If you haven’t had the chance so far to try OpenNebula 4.10, now is the time to download and install OpenNebula 4.10.1 Fox Fur. 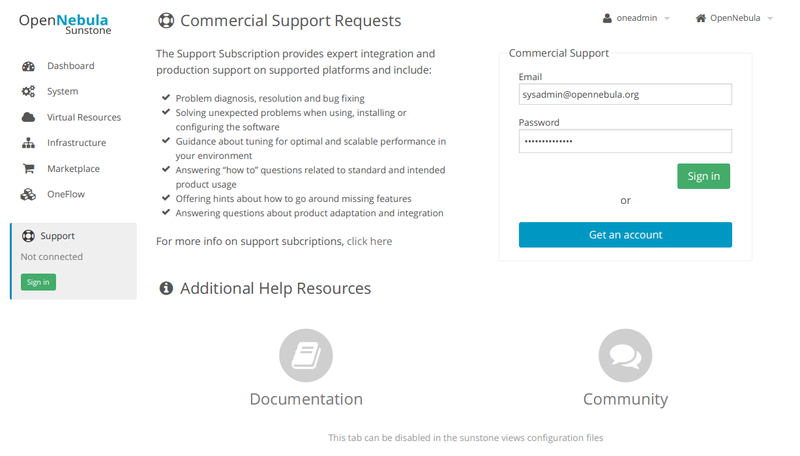 As as highlight, find below the newly introduced Sunstone gateway to manage commercial support tickets designed to boost productivity. We are pleased pleased to announce a new maintenance release of AppMarket. Release 2.0.3 solves issues reported by the community and has been verified to work with OpenNebula 4.10. Go ahead and read the Install AppMarket Guide. https://opennebula.org/wp-content/uploads/2018/11/opennebula_cloud_logo_white_bg-4.png 0 0 Jaime Melis https://opennebula.org/wp-content/uploads/2018/11/opennebula_cloud_logo_white_bg-4.png Jaime Melis2014-11-19 16:11:502014-11-19 16:11:50AppMarket 2.0.3 Released! Only a Few Days Left for OpenNebulaConf 2014! This edition of the conference is just around the corner, happening next 2-4 December in Berlin. If you are interested in attending the conference, we entreat you to register swiftly, since only a few seats are left. This year’s edition of the international OpenNebula Conference is packed with an amazing agenda. If you want to learn about Cloud Computing in general, and OpenNebula in particular. If you are familiar with the software or even an active user or contributor to the project, willing to hear and learn how other members of the community bend OpenNebula for their infrastructure needs, this is the place to be! Besides its amazing talks, there are multiple goodies packed with the OpenNebulaConf registration. Lightning talks, a hands-on tutorial, and meeting OpenNebula users and developers are some of the treats you are in for if you are attending the conference. One of the major benefits is the possibility to attend an OpenNebula tutorial the day before of the conference. This 3-hour tutorial is included in the registration, so everyone is welcome to attend it. The tutorial is intended for devops and system administrators interested in deploying a private cloud solution, or the integration of OpenNebula with other platforms. For those that already master OpenNebula, we are organizing a Hacking session that is meant for people that already has OpenNebula deployed and knows how to use it. You can catch up with OpenNebula developers and have conversations that are a bit hard to have in the mailing list. It is also a great place to meet other people that may be doing similar things or have already sorted out some of the problems you may have. Right on the riverside, in a beautiful part of Berlin, you can find the old dairy farm with its historic atmosphere. You can experience the most beautiful and varied shades of nature, associated with the four seasons with them. Last year’s conference was an absolute success, with fruity presentations of long time users of OpenNebula, and with various use cases that, we can confess, largely surprised the OpenNebula team for their artfulness. It is always a pleasure to see how people are using OpenNebula. https://opennebula.org/wp-content/uploads/2018/11/opennebula_cloud_logo_white_bg-4.png 0 0 Tino Vazquez https://opennebula.org/wp-content/uploads/2018/11/opennebula_cloud_logo_white_bg-4.png Tino Vazquez2014-11-19 10:37:352015-01-13 16:45:06Only a Few Days Left for OpenNebulaConf 2014! Why Ansible? Well, we were already using Ansible to perform repeatable deployments in our test environments to save us some valuable time compared to “manual” setups. This way we can test new code or deploy complete test environments faster. We currently have quite complete playbooks that use a combination of 3 roles. They do need some testing and when we feel they can be used by other people too, we’ll put them on the Ansible Galaxy. Until now we haven’t used Ansible to keep our config in sync or to do updates, but it’s something we have in the pipeline and should be quite trivial using the current Ansible playbooks. Another thing we’ll start working on are modules to support Opennebula. We already had a look at the possibilities Opennebula provides and should be quite trivial to build using its API. OpenNebula is 7 Years Old! Yes, time flies, and it is now time to celebrate the 7th anniversary of OpenNebula.org. In the post we wrote last year to celebrate our sixth anniversary we described the progress of the project in terms of its community, adoption and innovation. We are really proud to confirm that those figures are growing at the same rate. This year we would like to focus on our commitment to the open cloud. We think it is important to clearly state what “open”, “simple”, “scalable”, and “flexible” mean for us. Mostly because, as you well know, terms like “open-” and “open-source” are used by many vendors as a marketing tool to lock you into their own version or distribution of a hyped open-source software. Well, I think you know what we mean. Fully embedded in our commitment to the open-source world, we are immersed in a disruptive move, building a bridge between the proprietary virtualization field dominated by VMware and the open source cloud arena. We are doing so with an integration between OpenNebula and vCenter, easy to use and to deploy, bringing cloud features on top of production virtualized infrastructures. VMware users can take a step toward liberating their stack from vendor lock-in. Being OpenNebula a platform independent software, they can gradually migrate to open virtualization platforms. Looking back, it is inspiring the distance that we have come together. And that is nothing compared to what is planned for the future. We look forward to meeting you in a few days in Berlin in our second OpenNebula Conference, we have a lot to celebrate. https://opennebula.org/wp-content/uploads/2018/11/opennebula_cloud_logo_white_bg-4.png 0 0 Ignacio M. Llorente https://opennebula.org/wp-content/uploads/2018/11/opennebula_cloud_logo_white_bg-4.png Ignacio M. Llorente2014-11-17 17:55:432014-11-17 18:06:40OpenNebula is 7 Years Old! Tim Verhoeven, lead architect for a Business Intelligence and Analytics SaaS cloud platform at Deloitte Consultin, will give a keynote entitled “Practical experiences with OpenNebula for cloudifying a SaaS” in the upcoming OpenNebulaConf 2014 to be held in Berlin on the 2-4 of December. Tim will speak about how his team manages a SaaS platform for Business Intelligence and Analytics applications using a diverse set of middleware (mostly IBM). However the original setup of this platform was not done using a cloud architecture. In this talk they describe the reasons for selecting OpenNebula. The architecture of the new setup. The process of migrating to that new setup and the lessons they learned during that process and in the daily operation of the platform. And finally this talk will also cover their vision for the next step which is to move towards a hybrid cloud setup. Tim currently works for Deloitte Consulting in Belgium as the lead architect for a Business Intelligence and Analytics SaaS cloud platform. Tim Verhoeven is been involved in IT Infrastructure for more then 10 years and in these years gathered experience with Linux, networking, servers, storage and the tools and processes to deploy, manage and monitor these infrastructures. Do not miss this talk, register now, only a few seats are left! David Lutterkort, Principal Engineer at Puppet Labs, will give a keynote entitled “Puppet and OpenNebula” in the upcoming OpenNebulaConf 2014 to be held in Berlin on the 2-4 of December. This talk will show how Puppet can be used by adminsitrators to manage OpenNebula hosts, and by users to manage their infrastructure as well as how to use Puppet during image builds. Many facets of using an IaaS cloud like OpenNebula can be greatly simplified by using a configuration management tool such as Puppet. This includes the management of hosts as well as the management of cloud resources such as virtual machines and networks. Of course, Puppet can also play an important role in the management of the actual workload of virtual machine instances. Besides using it in the traditional, purely agent-based way, it is also possible to use Puppet during the building of machine images. This serves two purposes: firstly, it speeds up the initial Puppet run when an instance is launched off that image, sometimes quite dramatically. Secondly, it supports operating immutable infrastructure without losing Puppet’s benefits to organize and simplify the description of the entire infrastructure. As you may know, the lineup and agenda for the second OpenNebula Conference (due this 2-4 December in Berlin) are already closed. These high quality contents ensure that the conference is the perfect place to learn about Cloud Computing, and to understand how industry leaders of different sectors are using OpenNebula in their datacenters. We have two 30-minute sessions for lightning talks and there are still slots available, so now is the time to register and send us your proposal! https://opennebula.org/wp-content/uploads/2018/11/opennebula_cloud_logo_white_bg-4.png 0 0 Tino Vazquez https://opennebula.org/wp-content/uploads/2018/11/opennebula_cloud_logo_white_bg-4.png Tino Vazquez2014-11-10 11:20:152015-01-13 16:45:20Last Opportunity to Contribute to OpenNebulaConf: Lightning Talks Still Available!